The STORServer Hybrid Appliance (HA) is designed to use qualifying, customer-supplied hardware to provide a fully integrated STORServer solution. STORServer’s software technology bundle is loaded and fully integrated with your qualifying hardware for reliable, easy-to-use, expedient daily administration. Backup data across multiple platforms and locations including virtual machines, local and remote devices. Centralized management of all devices from one location. Supports most operating systems, applications and database technologies. Provides disk-to-disk-to-disaster recovery (DR) copy to disk, tape, cloud or STORServer Appliance. Can be powered by IBM® Spectrum Protect™, IBM® Spectrum Protect Plus™, or Commvault® Software. Scales for future growth and maximum return on investment. The STORServer Hybrid Appliance solution efficiently backs up multiple operating systems and email applications plus supports most popular database platforms (requires optional database agents). Backups and restores can take place across all network connections (NAS, SAN, LAN, WAN) from hundreds of storage devices. 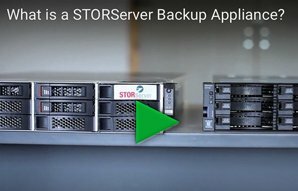 For more information about STORServer’s award-winning, proven backup appliance technology, please visit our “What is a Backup Appliance” page.